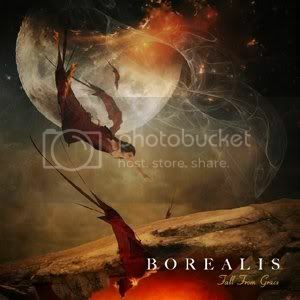 Lion Music recently announced the signing of Canadian power metallers BOREALIS who will release their new album Fall From Grace on May 20th. Produced and mixed by Jodan Valeriote in Ontario and mastered by Tomas Johansson at the world famous Panic Room Studios in Sweden (SCAR SYMMETRY, WARRIOR SOUL, MISERATION), this album is a sonic masterpiece, according to a press release. And topped by the fantastic artwork by Frank Fiedler, the entire package comes off as one of this year's most impressive power metal releases. Fall From Grace sees Borealis take a heavier approach for their label debut along with a more mature and progressive spin put on the songs when compared to their first appearance, but the bands song writing process in which every idea is explored and considered has not changed. On the new material bassist Jamie Smith comments, "We feel that because of song writing process this is a very diverse, energetic album. Lyrically, a few avenues were explored for the album, taking a more 'real life' approach than was taken before. Again, a collaborative effort on the lyrics ensured that they fit the music perfectly and reflected every band member's tastes in their own way."